You can enter up to 30 courses. Next input field appears when you enter grade into last box. Check advanced mode for courses credits and CGPA. What is a good GPA in high school? or have the slightest idea what a good GPA in high school is. Also, we'd recommend having a look at our other tool: final grade calculator📓 that helps in determining what your final grade will be, or what you can do to improve your result. And, if you're already a college student🎓, you may find the college GPA calculator useful. Some schools reward A+ with 4.3, so then it's possible to obtain the score exceeding the standard maximum of 4.0 GPA. The values in the table are typical but the percentage intervals and GPA scale may differ a bit between schools. Also, some courses provide extra points due to their difficulty, but you'll read more about that in the next paragraph. If you're wondering about the differences between weighted vs unweighted GPA, this paragraph is a must. Weighted or unweighted? This is a question! Unweighted GPA - How to calculate high school unweighted GPA? Did you notice that it's a standard average? Summing all scores and division by the total number of observations (4 courses). The things are getting more complicated when the credits for the courses appear. Some sources (e.g. gpacalculator.net) ignore the course's credits for unweighted GPA score, but others (like e.gpacalculator.io) keep them. If you enter the credits for your courses, we'll show you both results and you'll choose the one you need. Sounds fair, right? The courses with higher credits value have better marks, so the overall GPA is also higher in this case. Weighted GPA - How to calculate high school weighted GPA? Honors Courses most often give you additional 0.5 point (although you can find schools where it's awarded 1 point, check it first in your school's rules). Thus, having 4.0 in unweighted GPA score doesn't mean you're the best of the best - maybe you've just chosen the easiest courses? As two courses are not standard classes, they get extra points (A from Maths - 4.5 instead of 4.0, as it's an Honors course, A- from English - 4.7 instead of 3.7, as it's an AP course). And we'll finally use the high school GPA calculator! Pick up a grade for the first course. So it's 'A' for Maths in our example. Enter the class credits (if you have any) To have the credits displayed, hit the Advanced mode button. Change the default value from 1 to 0.5. Select the course type. Maths is an Honors course, so pick it from the drop-down list. Repeat until all courses from your grade sheet are included. It's ok if you want to enter less than four courses - the calculator ignores the blank boxes. Here you go! The high school GPA calculator did all the math, and the GPA value is displayed. Even more - both weighted and unweighted GPA are displayed. Awesome! We don't display separately GPA weighted with course difficulty but not with credits - we assumed that if you have chosen credits and course difficulty, you should take both of them into account in weighted GPA. If you don't change the credits default values, you'll get that value - weighted GPA, that is only weighted with course difficulty. As you probably noticed, the results agree with our manual calculations. Yay! This calculator can work as a high school cumulative GPA calculator. Click the Advanced mode button, and apart from course credits, two boxes will appear - your current GPA score and sum of credits you got. Note that this option gives valid results only if you type the sum of credits from which the current cumulative GPA was calculated. Let's continue on our example: we've calculated the GPA from our last semester of high school, but we'd like to know what's our overall cumulative GPA, after all these hard years! Assume that our cumulative GPA from all previous semester is equal to 3.60. Type this value into Cumulative GPA box. During all semesters, we did courses for 23 credits. Enter 23 into Credits. Under the calculator you'll find the GPA values as well as weighted cumulative GPA, which is equal to 3.62 in our example. There's no good answer for such question, as it all depends on you, your ambition, college you want to apply to, and many other factors. You may want to have a look at the data about average high school GPA to check where you are - but still, remember, that these are averaged values, and the average GPA differs with regard to gender, ethnicity, school, state, etc. 3.39 in other classes (PE, cooking). The numbers may be a bit outdated, as we know the growing trends of all grades, both in high school and colleges. That's why you can check a newer study from 2017 which shows that the overall average GPA is equal to 3.38. Yes, that's pretty jaw-dropping 😲. But don't freak out if you think that your GPA is too low - try as hard as you can and don't give up! Also, remember that many academic and non-academic aspects are important during application - and GPA value is only one of the factors. 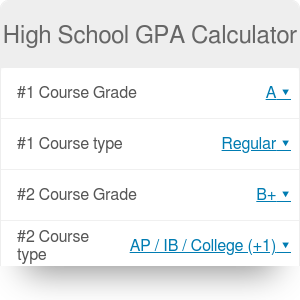 High School GPA Calculator can be embedded on your website to enrich the content you wrote and make it easier for your visitors to understand your message.